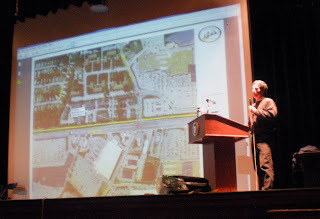 On October 22nd the first general public meeting of the Salem Bike-Ped Corridor project was held at the Salem High Auditorium. The presentation laid out the scope of the five mile Salem project, which has been broken into four sections. Short presentations where made by representatitves of the Windham and Derry trails, to tease the Salem supports with what they can look forward to. The highlight was when Greg Bakos of Vanasse Hangen Brustlin engineering firm presented satellite imagery with the trail demarked. Salem’s trail looks like it will be a charming mixture of greenspaces and sidewalks, opening up the entire length of Rt 28 shopping district to daily non-auto travelers. Methuen really does need to get in on this well before this project is in its advanced phase. The trail head at Hampshire St has already been targeted for a parking area and trail access point. Adding the 1.4 mile access to the downtown methuen, will make it easy for folks to get up to Salem using this corridor and also invite travelers to continue their journey all the way into Methuen center.